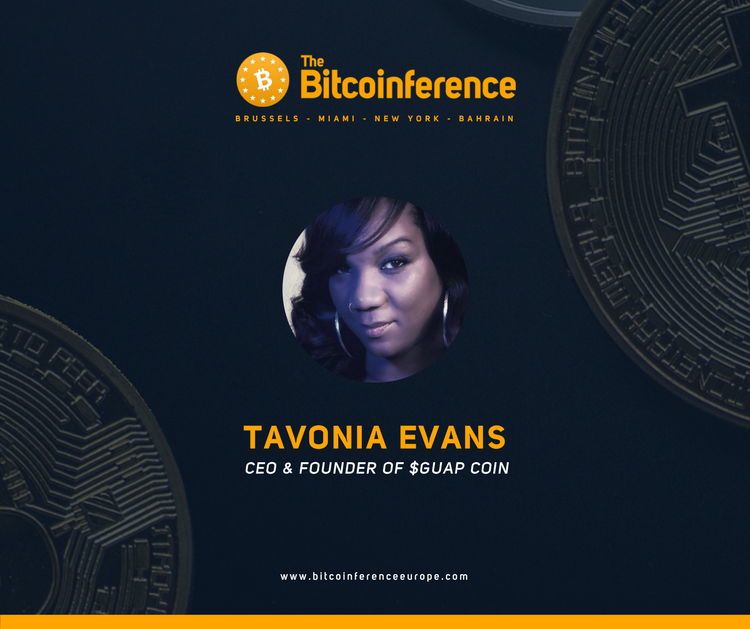 Tavonia Evans is a Cryptocurrency Expert & Evangelist and Certified Bitcoin Professional (CBP). She has held various positions in the corporate Tech Ladder. Her journey in tech began in Central Georgia Technical College where she studied from 2000 to 2002. Later on she joined Knechtel Group in September of 2013 as a Creative Director and SR. Developer. At Knechtel, she drives the design and development of websites for Knechtel Group clientele using WordPress. She also Consults on Social Marketing Campaigns and creates engaging creative content. In January of 2015 she co-founded Safe2Meet, and doubled as its Chief Marketing Officer. Safe2Meet is a reputation verification company based in Snellville, Georgia. It provides a peer to peer platform for managing identify and background verifications that generates digital credentials that can be shared. In May of 2017 she left Safe2Meet to develop her own Cryptocurrency known as $Guap Coin.This was one great way for her to use her vast skill in tech to foster support for Black-owned Businesses in her community. So what really is $Guap? It is a token built on Ethereum Blockchain technology that is designed to reward consumers for supporting black-owned businesses and urban institutions. It seeks to restore and expand “Black Wall Street”. It is not merely a coin, it is a movement. In recent times we have witnessed great technological advances that helped bring people together to achieve great feats. Tavonia put together a team inspired by the potential of tech to effect social change. Together they decided to jump on the crypto movement and use it to revitalize business communities. $Guap coin has since evolved into a platform (GuapX) that facilitates connecting Black businesses with tools that enable the ease of access to data on their markets and their clients, as well as ease of access to resources created to specifically support them and their needs. The Guap platform provides both the merchant and consumer the tools to build business relationships that will last for posterity. Tavonia’s experience in Design and Development of tech programs, Business Intelligence & Data and Marketing and her work in Enterprise, Government and Entertainment has led her here. When not working on GuapX, she teaches fundamentals of Cryptocurrency throughout the Black and Tech communities. As you can guess, she is passionate about empowering the black community.Guap funds, supports and circulates its coin among its merchant networks. It also allows consumers who support organizations and community businesses to use $Guap for their savings and receive $Guap tokens. They will later have access to their funds and the necessary tech infrastructure and tools to assist them build their own businesses.